When I was a graduate student at Caltech in the 1960s, my boyfriend and I loved to take a spin up the spectacular, cliff-hanging California Highway 39 that ascends in a 30-mile stretch from Azusa to the crest of the San Gabriel Mountains. He had a green Porsche Speedster, fully capable of providing a great joyride on the fairly isolated highway. Smog was a serious problem back then, but we’d go up on those wonderful days when the air was clear, the sky a deep blue, the vistas spectacular, and the pungent scent of the chaparral was in the air. Nowadays, nearly 3 million motorists cruise up Highway 39 every year. In addition to providing a thrill for joyriding tourists, the highway gives the 500 people who live nearby a way to get to their homes. It provides firefighters access to the Angeles National Forest, and it’s the entrance point for three flood control dams. In 1978, a major landslide destroyed part of the highway’s upper section, isolating the lower 27 miles from the Angeles Crest Highway. The road still hasn’t been completely repaired—and various government agencies and special interest groups are to this day wrestling over whether to finish the job, which is estimated to cost $50 million. In 2011, Caltrans, which owns this stretch of road, asked both the U.S. Forest Service and Los Angeles County to take over the highway and assume responsibility of its $1.5 million annual maintenance cost. (By comparison, the median cost of maintaining a 30-mile long, two-lane highway in the U.S. is about $180,000.) Both have “gracefully declined to take on this responsibility,” one manager for Caltrans told the L.A. Times in 2012. Highway 39 and the threat of landslides is just one example of the costs—financial and social—that natural disasters exact on different regions of California. The Rim Fire in Yosemite in August 2013 covered a gargantuan 400 square miles, but two others were even bigger: San Diego County’s Cedar fire in 2003, and the 2012 Rush fire in Lassen County. California budgets roughly $170 million for firefighting alone. There are also major floods and even the occasional hurricane (known in the West as a cyclone) or volcanic eruption. And, of course, there are the earthquakes. Experts say there is near certainty (to be accurate, a 94 percent chance) that a magnitude 6.7 earthquake will rock California in the next 30 years, and a 46 percent chance of one 7.5 or greater, with Southern California the likely center. There is only about a 4 percent probability of a magnitude 8.0 or greater earthquake likely in Northern California or the Pacific Northwest, but the toll in lives would be in the thousands and in money, hundreds of billions of dollars. The sheer variety of disasters makes California unique within the United States. Yet when viewed globally, the state is something of a disaster microcosm. Other parts of the country and world share California’s struggles with the costs of disasters. New Orleans and the East Coast are still rebuilding after the devastation of Hurricanes Katrina and Sandy. The Colorado floods in September were the largest in centuries—recovery is expected to take years and cost more than $2 billion. Japan and parts of Asia are still recovering from the Tohoku earthquake and tsunami of 2011 and dealing with costs exceeding $122 billion. Although mega-disasters grab the headlines, even natural hazards that go relatively unnoticed by the press can impact communities. How many people have heard of the fire and repeated floods of the past few years suffered by the Santa Clara Pueblo in New Mexico? Or of last summer’s mid-August floods in China and neighboring parts of Russia that killed more than 85 people and displaced nearly 900,000? Or the snowstorms in 10 regions of the Andes in early September that sparked a state of emergency, killed tens of thousands of animals, and affected 100,000 people? Even very small natural events can wreak havoc. The rather puny eruption of the Eyjafjallajökull volcano in Iceland in 2010, for example, disrupted global air traffic to the tune of about $5 billion. Increased population density makes people especially vulnerable in a natural disaster, and globalization spreads and multiplies the effects of a disaster far beyond the local site of the disaster itself. Disasters, large and small, connect California’s different agencies, governing bodies, and citizens with one another. They also connect the state—scientifically, economically, and strategically—with the rest of the world. 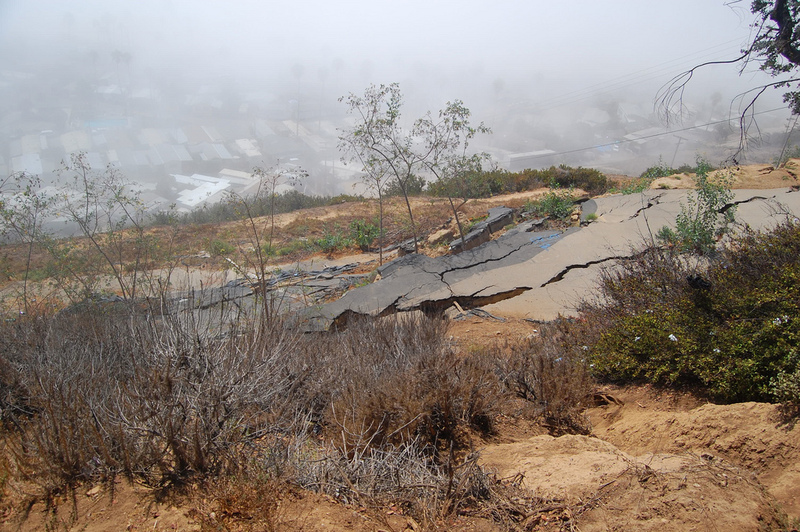 California scientists have worked with their colleagues around the globe to greatly increase our understanding of the geologic processes that cause disasters. But protecting ourselves from the inevitable disaster requires that we not only have a scientific understanding—we also need to have a broad and communal, even an international, response. Scientists provide impartial facts, but they cannot be alone in helping to prepare for, and recover from, disasters. To rebuild devastated communities, we also need engineers to propose and implement technical solutions, financiers to manage costs, and negotiators to balance the realities of political, economic, religious, and cultural values. We need people who are responsible for collecting and responding to input from diverse stakeholders and who will ensure that recommendations are agreed upon, communicated, and implemented. California has done this with its extensive earthquake preparedness programs and with the U.S. Geological Survey’s California Volcano Observatory. But in all too many disaster situations, the links among scientists, engineers, community leaders, public health officials, and others are not as strong as they should, or can, be. This was tragically revealed in the events that unfolded before and after the 2009 earthquake in L’Aquila, Italy, when 309 people died and six scientists and a government official ended up convicted of manslaughter for downplaying the threat of tremors days before the disaster. We need to forge better connections among people working in different fields as well as to every citizen who potentially lies in harm’s way. It starts with more international collaboration among everyone—not just scientists. Japan, Italy, New Zealand, Chile, the Philippines, and Iceland have extensive experience in volcanic eruptions, earthquakes, and tsunamis. Australia, China, and Africa have experienced many floods and droughts. Their experiences can inform California and U.S. disaster workers. But the United States has been a world leader in the science, engineering, and policy practices of natural disaster response, and should continue to devote resources to ensuring that leadership. The many players and decision-makers involved in prevention and mitigation of and recovery from disasters of all kinds in California are a microcosm of those needed on the global stage. Susan W. Kieffer is professor emerita of geology at the University of Illinois Urbana-Champaign, a MacArthur Fellow, and a member of the National Academy of Sciences. She hosts the blog Geology In Motion. These ideas in this essay are elaborated in her book The Dynamics of Disaster (W.W. Norton). Primary Editor: Kathryn Bowers. Secondary Editor: Becca MacLaren. *Photo courtesy of Pete Morris. earthquake, geology, natural disaster, public health, science, Thinking L.A.